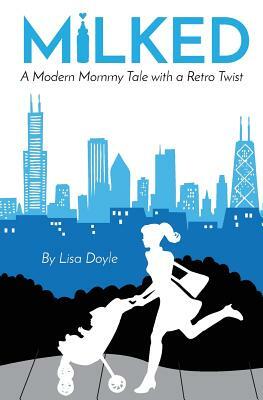 Lisa Doyle is a writer, mother, and wife living in the Chicago area. After earning a Bachelor of Arts degree in English/Journalism at Miami University in Oxford, OH, she worked for publishing companies editing business-to-business publications for the cosmetic, spa and salon, and fragrance industries. Lisa has written articles for major beauty trade publications, including Global Cosmetic Industry, Skin Inc., Salon Today, Modern Salon, Renew, and Suburban Life. She is currently a communications manager for a nonprofit organization that serves as an advocate for the homeless. Lisa’s debut novel, Milked, features a single parent, Amanda, who unexpectedly has no income and no savings. When a friend suggests she try being a wet nurse, she takes a chance with this seemingly outdated practice and finds herself working for some of Chicago's most elite families. The story is told by Amanda with humor and honesty throughout the ups and downs of her experiences dealing with unusual situations as a wet nurse. Rhonda Havig talked with Lisa Doyle about writing her first novel, the inspiration behind the topic of wet nursing, and the importance of having a support system. Rhonda Havig: You have a background in writing and editing for trade publications and nonprofit organizations. What motivated you to write a novel? Lisa Doyle: I always knew that I wanted to write a novel at some point in my life, but without any kind of deadline, it wasn't something that had ever materialized. Then, in 2008, I learned about National Novel Writing Month (NaNoWriMo), which is a contest/challenge to complete a 50,000-word novel in 30 days. The event takes place each November, and I think I learned about it on October 27 or 28. I scrambled a bit, but I put an outline together, and I wrote my first novel—finishing around 51,000 words—on November 29. It was exhilarating to complete the challenge and know that it truly was possible. I occasionally tinker with that novel, but it is far from ready for publication! Perhaps someday. RH: You participated in NaNoWriMo before having a baby and again after. How different was your second NaNoWriMo experience after the birth of your child? What, if any, changes did you make to your approach from the first time you participated? LD: Actually, it was not so different from the first time around! I'd written my first book in the evenings after work, thinking, "Good thing I'm doing this now, because I'll never have time to write once I have kids." Then, the second time around, I'd still write around 7 p.m. each night after putting my son (who was two years old) to bed. I suppose I was probably more tired while writing the second novel (I'm permanently tired), but since becoming a mother, I'm much better at multi-tasking and managing my time. Now, anyone who can write a novel with a newborn, my hat's off to her. RH: That second NaNoWriMo experience resulted in Milked, which you entered into the Amazon Breakthrough Novel Award. (The contest was discontinued in 2015.) What prompted you to enter the contest, and what was that experience like? LD: One of my friends who knew I'd participated in NaNoWriMo alerted me to the contest in January 2013, which prompted me to finish editing the novel and submit it to the contest in time. It was wonderful to reach the second round, as only about 20 percent of entries get that far. What was especially valuable was to receive feedback from judges, which helped me further edit and improve the novel. While, of course, it would have been thrilling to make it further in the contest, the feedback alone proved to be quite useful, and I'm grateful to have received it. RH: Before Milked was published by Simon and Fig, you self-published the book on Amazon. How did you feel when you realized that people you didn't know were buying copies? At what point did you decide to find an agent? LD: It was really exciting! Within a few weeks, I began to think that if strangers were buying my book when it was "just" self-published, maybe even more would want to buy it if it came from an established publisher. That's when I started to look into the process of getting published and realized I needed an agent. So, I began the query process that summer, and, by fall, I was signed with Claire Anderson-Wheeler of Regal Literary (which is now Regal Hoffmann & Associates). I was thrilled to have found such a fantastic agent who believed in me! RH: Do you have any advice to share with authors who are considering whether to self-publish or find an agent and pursue traditional publishing? LD: I think both have their merits, but traditional publishing has worked out better for me. I am glad to have found a home for Milked with Simon and Fig and to have developed a great working relationship with the publisher, Stacey Holderbach. I believe that Milked received more media attention, more presence, and more sales thanks to the PR efforts of my agent and publisher, and I'm really pleased with the results. RH: What were the main lessons learned you learned during the process of working with your agent to prepare Milked for submission to publishers? LD: Trust your agent! At least, I certainly do. I am so lucky to have Claire in my corner. She could teach a master's-level class in the art of constructive criticism and helps me improve my writing by leaps and bounds. RH: Wet-nursing is not a practice we hear about much these days. What inspired you to incorporate it into a modern-day story? LD: My son inspired me. I came up with the idea when he was two, as I'd been nursing him since he was born. During one nursing session, I thought, "Man, if I had a dollar for every time I nursed him, I'd be swimming in a pool of money like my name was Scrooge McDuck." Then I thought, "Hmm…do people do this? I bet that would make for an interesting book." I'd been considering participating in NaNoWriMo again that year, and the timing worked out. I began thinking about the different ways that someone could find herself falling into the profession and the different kinds of families who'd have the means to hire a wet nurse. RH: What feedback have you received about how the topic of a woman not breastfeeding her own child, by choice or ability, was handled in Milked? LD: Of course, there have been a few people who were put off by the idea. There were comments that the book's concept was "just too weird" or "not my thing," and there were some who judged Amanda for drinking too much (evidently, mothers should be teetotalers, who knew?!). But most of the feedback I've received has been positive—whether the reader had experience with breastfeeding or not—in that they felt it was a unique story and one they hadn’t read about before. The book's about much more than just nursing, and I think most readers recognize that. RH: When Amanda, the protagonist of the novel, runs out of savings, she goes to the Women, Infants, and Children (WIC) clinic to apply for public assistance. She is uncomfortable about her situation and becomes frustrated when she finds out she has to first register with the Department of Human Services. What advice would you give to mothers who are afraid of or embarrassed about seeking public assistance? LD: I'd urge them to feel all the feelings they might have about it, because it can be a difficult and humbling experience to ask for help. I've worked for many years for nonprofits that serve low-income residents in a wealthy county, and it's given me a lot of perspective. Help is often there for those who need it, but, sometimes, it can be hard to know where to start, overwhelming to go through registration processes, and gut-wrenching to even ask for assistance. And, while most agencies will treat clients with dignity and respect, there's going to be some of them that don't. I get it—overall, the whole process can feel like a bad dream, especially when someone has to go through it unexpectedly. But I would advise anyone to not let pride hold them back from obtaining the help they need, because that's not going to help. I'd also advise them to get all their ducks in a row and all the paperwork completed before each meeting. And to stay optimistic and keep moving forward. RH: Amanda has a great support system in her friends and family. How important is a support system to you as a mother, woman, and writer? LD: It's critical. It would be very difficult to manage a full-time nonprofit career, a part-time writing career, and feel like I'm succeeding as a mom without it. I am fortunate to have a husband who's supportive and never tries to hold me back from accomplishing my goals. He's also a writer, and, aside from my agent, the only one I'll discuss my writing with while in the process of a novel. And I'm very lucky to have my mom just 30 minutes away. She's a huge help, and I love seeing the bond grow between her and my son. RH: What are some of the differences you noticed between writing a novel and the writing you have done in the past for work? LD: The writing I do is completely different. My novels are fiction, but, at my day job, I'm part of a development team for a nonprofit that helps homeless families in my area. For this position, I manage the organization's social media, write the newsletters, create the annual report, write appeal letters, and so forth. But for both, I get to employ my creativity and my own personal touch, and I appreciate that I get to have the best of both worlds when it comes to my two careers. RH: What can we look forward to from you next? LD: What I'm working on now is completely different from Milked. It's not mom lit, but it still has a sense of humor about it and has a likable (anti-?) heroine. It might be another year or two before it hits the shelves, but I will keep you posted! Rhonda Havig is a writer, wife, and mother who works in web development. She has a BA in Communication from Stephen F. Austin State University in Nacogdoches, TX, where she studied mass media, advertising, and English. Rhonda has written a novel and is currently revising it to pursue publication. Fascinating! Am definitely going to read her work.